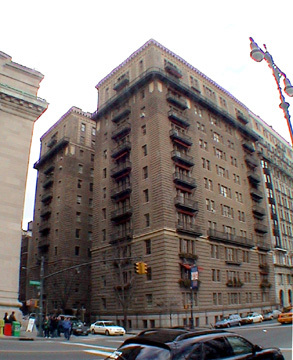 This impressive, pre-war, 12-story apartment building is a cooperative and has 85 apartments. Like the Dakota, its famous neighbor eight blocks to the north on Central Park West, this building has its entrance on the sidestreet with a manned gatehouse. The Dakota has an arched entrance that leads to a large courtyard with entrances at each of its four corners. Harperley Hall has an open court in the shape of a "T" with three entrances along the top of the "T." While many buildings have deep "light courts" such as this, most are not as "finished" as the facades here facing the court. The building is surrounded by an attractive and tall wrought-iron fence in front of a "moat." The building, which has sidewalk landscaping, has many wrought-iron balconies and one continuous balcony that curves round the building's Central Park West corner two floors down from its cornice. There are also numerous window surrounds with pilasters. The apartments have high ceilings and large windows. The very handsome building is across 64th Street from the distinguished, low-rise building of the New York Society for Ethical Culture, which affords many of its apartments better views and more "light and air." The building has four lantern stanchions but no health club. It has a garage for 11 cars and two lushly landscaped roof decks, one on each wing. It is close to the Lincoln Center for the Performing Arts, and many restaurants and stores. It is very convenient to excellent bus service and subway stations are a few blocks away. One of its residents for several years is Madonna, the rock diva. The building was completed in 1910 and was designed by Henry W. Wilkinson.